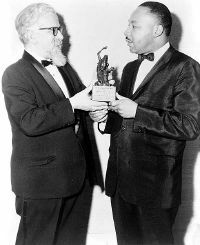 Rabbi Abraham Heschel presenting Judaism and World Peace award to Dr. Martin Luther King, Jr. Rabbi Abraham Joshua Heschel (January 11, 1907 – December 23, 1972) was a major thinker of Conservative Judaism and leading U.S. social activist, considered by many to be one of the most significant Jewish theologians of the twentieth century. An exponent of the Jewish prophetic and mystical traditions, Heschel sought a middle ground between the critical approach to Jewish tradition as represented by Reform Judaism and what he saw as the legalism of Orthodoxy. He also sought to interpret Judaism in terms of the modern philosophy of religion. On the foundation of his intellectual achievements in the 1950s, Heschel won fame as an activist for civil rights and an opponent of the Vietnam War in the 1960s. He was also a leading activist for freedom for Soviet Jewry. Heschel was chosen by American Jewish organizations to negotiate with leaders of the Roman Catholic Church at the Vatican Council II. He helped persuade the Church to eliminate or modify passages in its liturgy that demeaned the Jews and called for their conversion to Christianity. Heschel is one of the few Jewish theologians widely read by Christians. His most influential works include Man is Not Alone, God in Search of Man, The Sabbath, and The Prophets. His theological works argued that the religious experience was a fundamentally human impulse, not just a Jewish one, and that no religious community could claim a monopoly on religious truth. Born in Warsaw on January 11, 1907, Heschel was a member of preeminent rabbinic families of Europe both on his father's and mother's sides, and a descendant of Rebbe Avrohom Yehoshua Heshl of Apt. He was the youngest of six children. In his teens he received a traditional yeshiva education, and obtained ordination as a rabbi. He then studied at the University of Berlin, where he received his doctorate, and at the Hochschule für die Wissenschaft des Judentums, where he earned a second, more liberal, rabbinical ordination. Heschel's teachers included some of the best German-Jewish thinkers: Chanoch Albeck, Ismar Elbogen, Julius Guttmann, and Leo Baeck. He later taught the Talmud in Berlin, Frankfurt, and Warsaw. Escaping from the Nazis, he found refuge both in England and the United States, where he briefly served on the faculty of Hebrew Union College (HUC), the main seminary of Reform Judaism, in Cincinnati. Increasingly uncomfortable with the lack of observance of Jewish law at HUC, Heschel sought for an academic institution which upheld Jewish customs as normative but, like HUC, also allowed critical modern scholarship of the Bible and the Talmud. He found such a place in 1946 when he came to the Jewish Theological Seminary of America (JTS), the main seminary of Conservative Judaism. He accepted a position there as Professor of Jewish Ethics and Mysticism, where he served until his death in 1972. He married Sylvia Straus on December 10, 1946, in Los Angeles. They had a daughter named Susannah who eventually became a scholar of Judaism in her own right. Heschel explicated many facets of Jewish thought including studies on medieval Jewish philosophy, Kabbalah, and Hasidism. He had a special interest in the prophets and their lives. His books contain civil but pointed rejoinders toward those in Reform Judaism who no longer held that Jewish law was normative, and also toward those in Orthodox Judaism who valued legalism over the spirit of the law, according to Heschel. His views were strongly criticized by his colleague Mordechai Kaplan, founder of Reconstructionist Judaism. Kaplan affirmed that God is not personal, and that all anthropomorphic descriptions of God are, at best, imperfect metaphors. Kaplan also held that Jewish law is no longer binding on Jews. Many students who attended JTS in the 50s sympathized with Kaplan over Heschel. Heschel also saw the teachings of the Hebrew prophets as a clarion call for social action in the United States and worked for black civil rights and against the Vietnam War. After marching with Martin Luther King, Jr. in Selma, Alabama, Heschel said: "Legs are not lips, and walking is not kneeling. And yet our legs uttered songs. Even without words, our march was worship. I felt my legs were praying." Heschel played a prominent role at the National Conference of Religion and Race in Chicago in 1963, which helped to organize the March on Washington later that year. Later, Heschel served as co-chairman of Clergy and Laity Concerned about Vietnam, a key component of the growing opposition to the Vietnam War. He was also a major force in the campaign to promote the human rights of Soviet Jewry. Heschel also made history in his efforts to reconcile Jews and Catholics. He was an important influence at the Second Vatican Council in the crafting the 1965 statement Nostra Aetate which which is seen as a turning point in the relations between Christians and Jews. Several aspects of Catholic teaching and liturgy were changed as a result, no longer blaming the Jews for Christ's death and refraining from calling for Jews to convert to Catholicism. Heschel died on December 23, 1972 at his home in New York City. This work started out as his Ph.D. thesis in German but was later expanded and translated into English. Originally published in a two-volume edition, it covers their life and the historical context that their missions were set in, summarizes their work, and discusses their psychological state. In it Heschel promulgated what would become a central idea in his theology: that the prophetic (and, ultimately, Jewish) view of God is best understood not as anthropomorphic but rather as anthropopathic—that God has human feelings. He emphasized the social role of the prophets as men who courageously spoke the truth to those in power, be they kings, priests, or those who controlled great wealth. It remains widely read today. The Sabbath: Its Meaning For Modern Man is a work on the nature and celebration of the Jewish Sabbath. This work is rooted in the thesis that Judaism is a religion of time, not space, and that the Sabbath symbolizes the sanctification of time. He also promulgated Hasidic and kabbalistic views which see the Sabbath as a type of manifestation of God's grace, which is to be welcomed by the Jewish community with mystical gratitude. Unlike Reform Jews, Heschel insisted that proper observance of the Sabbath was crucial to Judaism. Man Is Not Alone: A Philosophy of Religion offers Heschel's views on how man can approach God, who is beyond comprehension. Judaism views God as being radically different from man, so Heschel explores the ways that Judaism teaches that a person may have an encounter with the ineffable. A recurring theme in this work is the radical "amazement" that humans experiences in the presence of the Divine. Heschel also explores the problems of doubt and faith, what Judaism means by teaching that "God is one," the essence of humans and their needs, the definition of religion and Judaism, and man's yearning for spirituality. God in Search of Man: A Philosophy of Judaism is a companion volume to Man is Not Alone. In this book Heschel discusses the nature of religious thought, how thought becomes faith, and how faith creates responses in the believer. He discusses ways that humans can seek God's presence and the radical amazement that humans receive in return. He offers a criticism of nature worship, a study of man's metaphysical loneliness, and his view that we can also consider God to be in search of man. He studies the concept of Jews as a chosen people, the idea of revelation, and what it means for one to be a prophet. Heschel rejects the idea that mere faith (without law) is enough, but then cautions against adding too many added restrictions in Jewish law, as imposed, he believes, by many Orthodox rabbis. He discusses the need to correlate ritual observance with spirituality and love, the importance of kavvanah (intention) when performing mitzvot. Heschel also wrote a series of articles on the existence of prophecy in Judaism after the destruction of the Holy Temple in Jerusalem in 70 C.E. These essays were published in English as Prophetic Inspiration After the Prophets: Maimonides and Others by the American Judaica publisher Ktav. The book counters the traditional view that prophecy ended early in the Second Temple era, around the fourth century B.C.E. Countering this, Heschel argued that prophecy continued during of the inter-testamental and medieval periods. He held that prophetic inspiration occurred even in post-Talmudic times into the modern period and emphasized that prophecy involves men of God standing not only for religious truth, but also for social justice. Many consider Heschel's Torah min HaShamayim BeAsafklariah shel HaDorot (Torah from Heaven in the light of the generations) to be his masterwork. The three volumes of this work are a study of classical rabbinic theology and aggadah (exegesis), as opposed to halakha (Jewish law.) It explores the views of the rabbis in the Mishnah, the Talmud, and the Midrash about the nature of Torah, the revelation of God to mankind, prophecy, and the ways that Jews have used scriptural exegesis to expand and understand these core Jewish texts. In this work Heschel views the second century sages Rabbis Akiva and Ishmael ben Elisha as paradigms for the two dominant world-views in Jewish theology. Abraham Heschel had a significant impact on twentieth-century Judaism, taking a leading role in the Jewish commitment to the Civil Rights Movement, the anti-Vietnam War protest movement, and the campaign for the human rights of Soviet Jewry. Even if one did not agree with some of his political opinions, his writings and example showed that the true spirit of the prophets lives not simply in theology but in social action. His ecumenical work with the Catholic Church during Vatican II did much to heal the historical breach between Christianity and Judaism, by influencing the Church to remove many of the parts of its liturgy that were offensive to Jews. In theology, Heschel took the middle ground between the liberalism of Reform Judaism and the conservatism of Orthodoxy. He emphasized that God is not anthropomorphic in form, but that God and humans do share common feelings such as the desire for love and indignation at injustice. His many thought-provoking books continue to stimulate questions and debates among Jewish theological students today and remain among the few Jewish theological books read by Christians. Heschel's life's work has inspired three namesake schools: one on the Upper West Side of New York City, one in Northridge, California, and one in Toronto, Canada. "Never forget that you can still do your share to redeem the world in spite of all absurdities and frustrations and disappointments." ↑ Neil Gillman, Conservative Judaism: The New Century (West Orange, NJ: Behrman House, 1993, ISBN 0874415470), 163. ↑ Edward K. Kaplan, Abraham Joshua Heschel: Prophetic Witness (Yale University Press, 2007, ISBN 978-0300124644). History of "Abraham Joshua Heschel"
This page was last modified on 25 January 2019, at 17:11.